Christmas Eve was a funny old day. 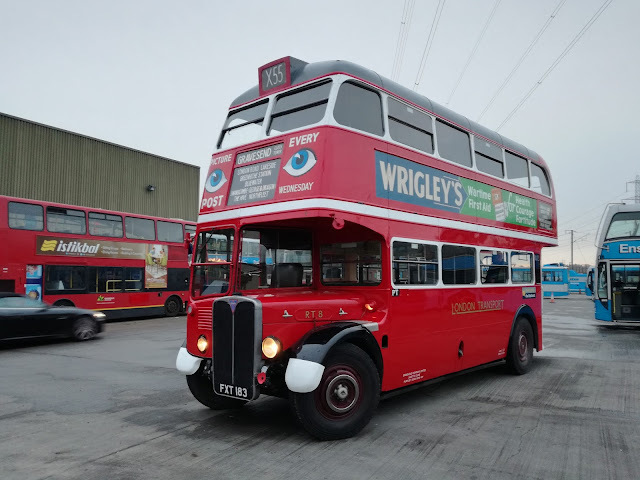 It started very early, with a 93 mile drive from chez Steve to Ensign's depot in Purfleet. Those magnificent men in their vintage machines were supplying 2 vehicles for the Greenline 702 Running Day. This running day had been pretty hastily arranged due a strange anomaly and was in aid of charity. On 27th December Reading Buses take over from First Berkshire in the operation of the Bracknell - Windsor - Slough - London Greenline 702. 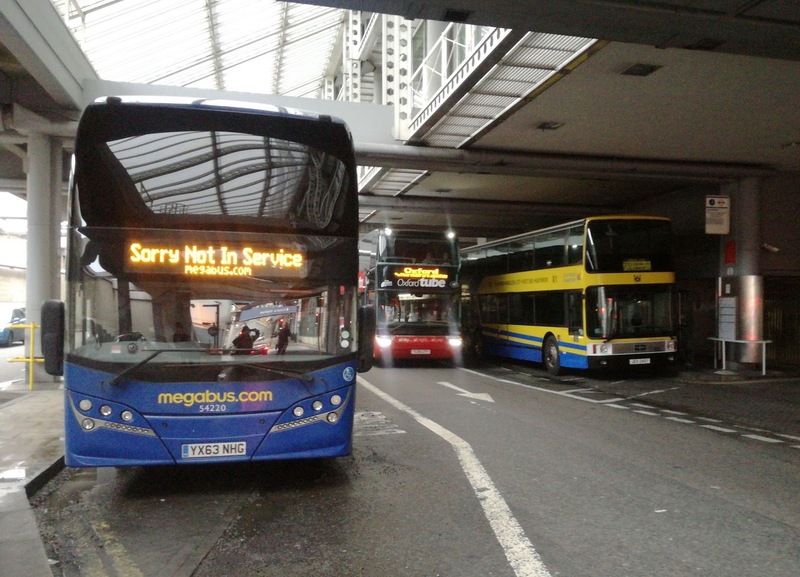 However First ceased operation on the 23rd December, leaving the 24th without an official operator. So the inspirational Martijn Gilbert, CEO of Reading Buses called a few mates to see if they'd like to bring their buses out for the day on the route. The idea got a big thumbs up, and so Sunday saw a plethora of buses on the 702. Some with links to the route, others not. 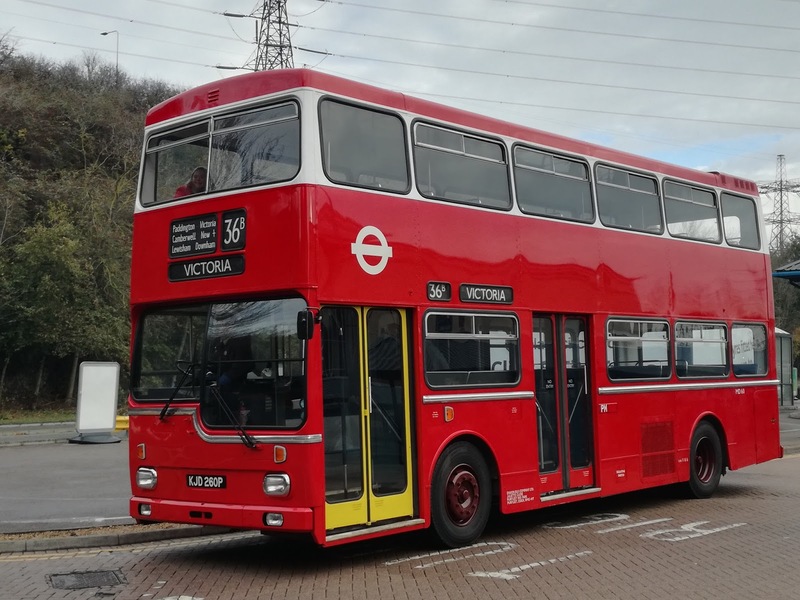 My plan was to meet up with Ross Newman at Ensign, who was booked to drive Greenline liveried RT3232 and who had invited me along. However, with Ensign's hectic Christmas schedule Ross quite rightly decided to put family first. 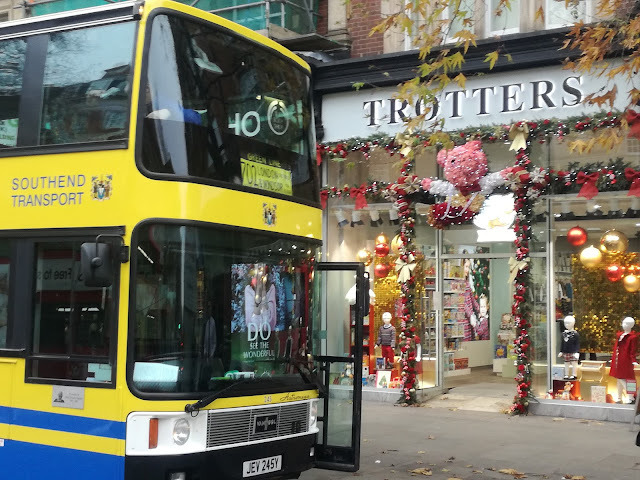 No worries, I was still able to travel up on the RT and back on Ensign's magnificent ex Southend Transport Van Hool Astromega. So I arrived at Ensign at 0730 only to discover the RT had departed at 0700, an hour earlier than Ross intended to. That meant my plan to stay with the RT to Slough then catch one of the Scania Omnilink tri axles Reading Buses have acquired for the route back to London was well and truly scuppered. So I was forced to wait for the Astromega to leave. I know I know, sheer torture but you have to take the rough with the smooth. While I was waiting a Private Hire driver turned up to take one of the BCI Enterprises out. I've yet to meet an unfriendly person at Ensign, so a good chat about the Enterprise ensued, and a photo opportunity. Incidentally just to the right of the Enterprise was a sight that I doubt could be replicated anywhere in the world. If anyone knows different then I'll be happy to be corrected. Back to the 1950's anyone? Then entering stage left came a chap with a big smile and just as big handshake. Glyn Matthews, who was already bringing me back, discovered he was taking me there too. I got my first look inside the Astromega, and I'm pretty sure it was my first ever look inside one. I grew up with Olympian coaches, but pretty sure I never experienced an Astromega. I missed out. To say the seats are comfy is an understatement. I started downstairs but soon realised this needed a proper ride test and went upstairs. 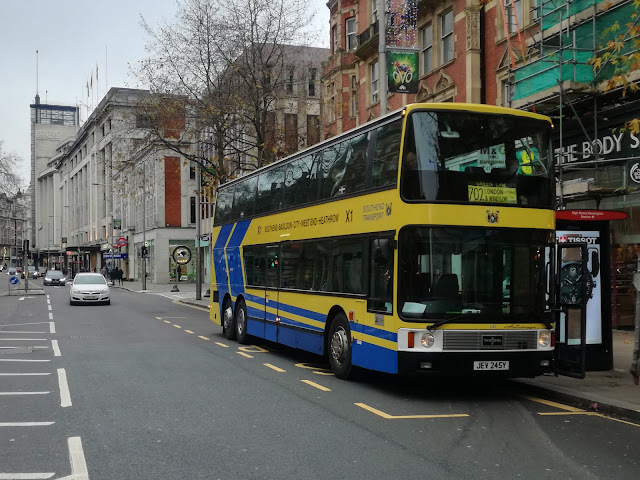 The obvious comparision was with modern tri axle coaches, and at a stunted 13"1 the obvious comparison was with my adored Plaxton Interdecks used by Megabus. Quite simply I couldn't split the ride quality, but the Astro nicked it on seat comfort. 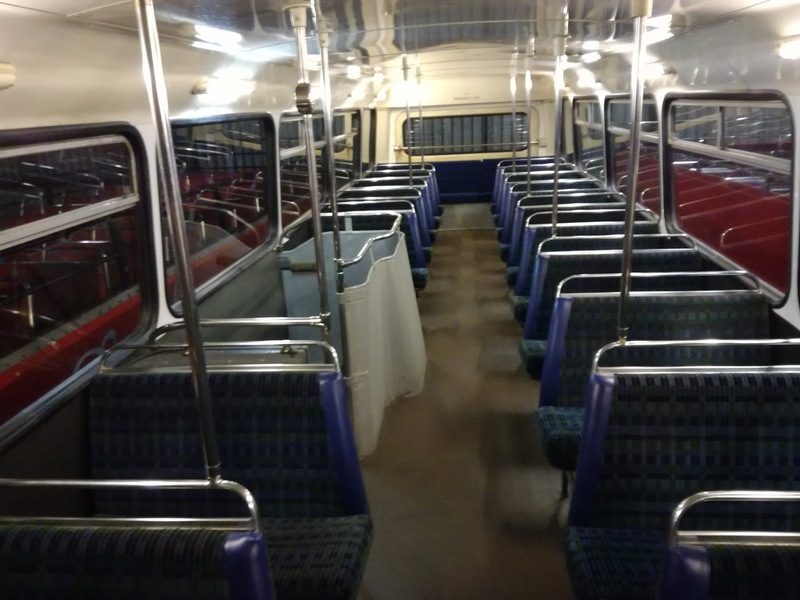 That led to a conundrum - was the Astro decades ahead of its time, or has there been little progress in comfort and ride quality of tri axle coaches over the last 35 years? Yes obviously there have been improvements in fuel economy emissions, accessibility etc, but your average passenger isn't going to notice that - indeed as the Running Day was incorporating the regular service we picked up regular passengers. One chap boarded at Hammersmith and asked if we had USB chargers on board. They woudn't look out of place. 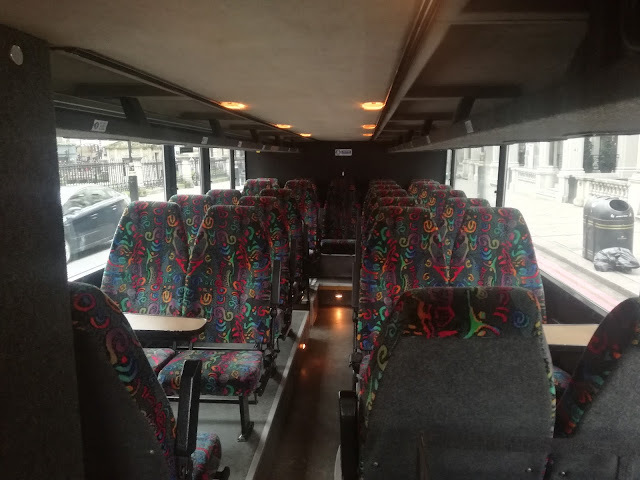 Why are 35yo seats more comfortable? Is that progress. Anyway we arrived at The Collonades in Victoria and immediately got the chance to get the picture to go with the comparison. 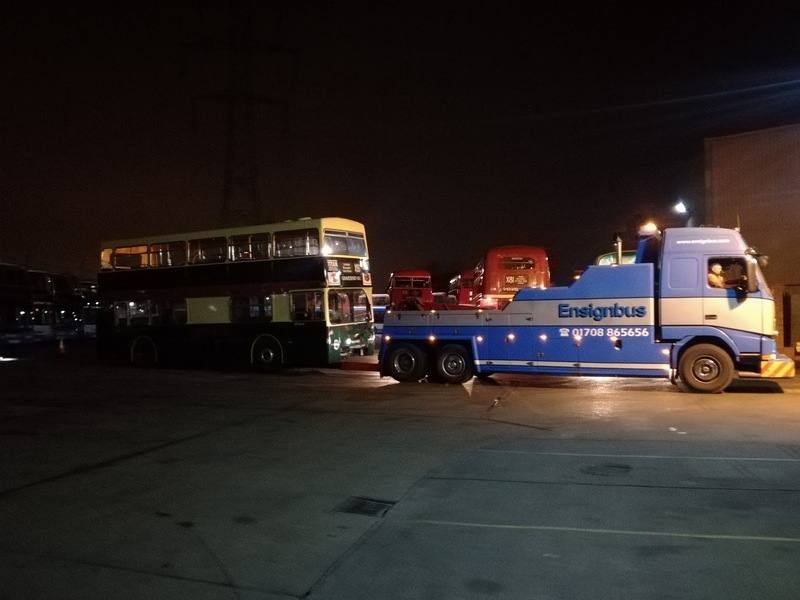 A trio of tri-axle triumphs with the Volvo B11R Plaxton Elite Interdeck, and the latest Van Hool decker passing the trailblazer. 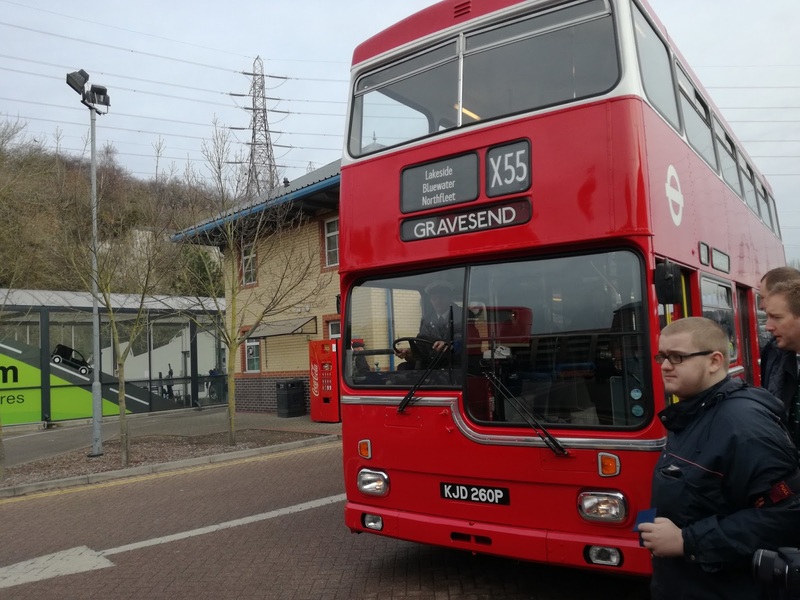 It was at this point I realised Glyn, apart from being a nice bloke and good driver, was also an avid bus enthusiast. I watched him scurrying from place to place taking pictures of everything that moved, including every single Levante that passed through. I was later to discover Glyn's knowledge is truly extensive, and he could even discuss the old Boro'line fleet with me, fleet numbers and all. 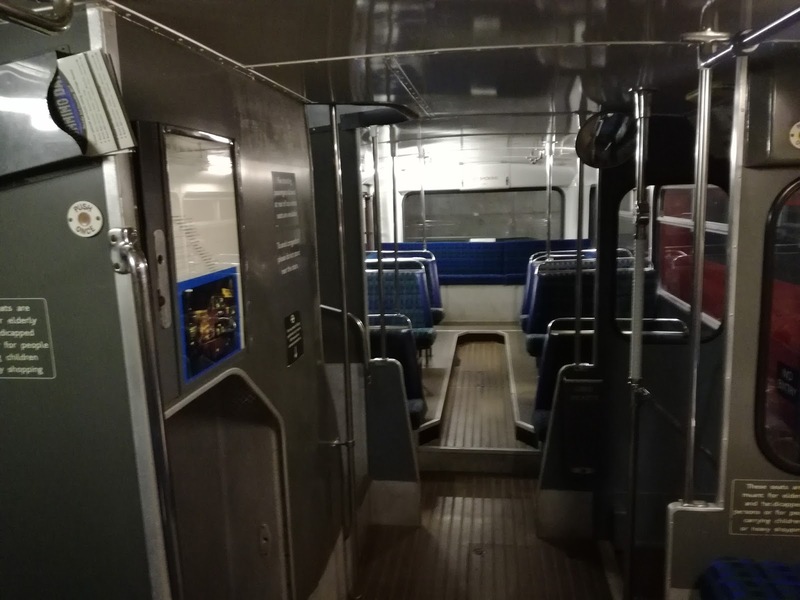 We left Victoria with an old Greenline relic. RF226 looked really good, and I know carried quite a few distinguished passengers. We played leapfrog along the route, and as extensive journey times had been given, there were plenty of photo opportunities, although to my shame I appear to have concentrated on the Astro! Some photos just beg to be taken, and when Glyn pointed out the shop we were parked outside this one just had to be captured. Luvvly Jubbly! 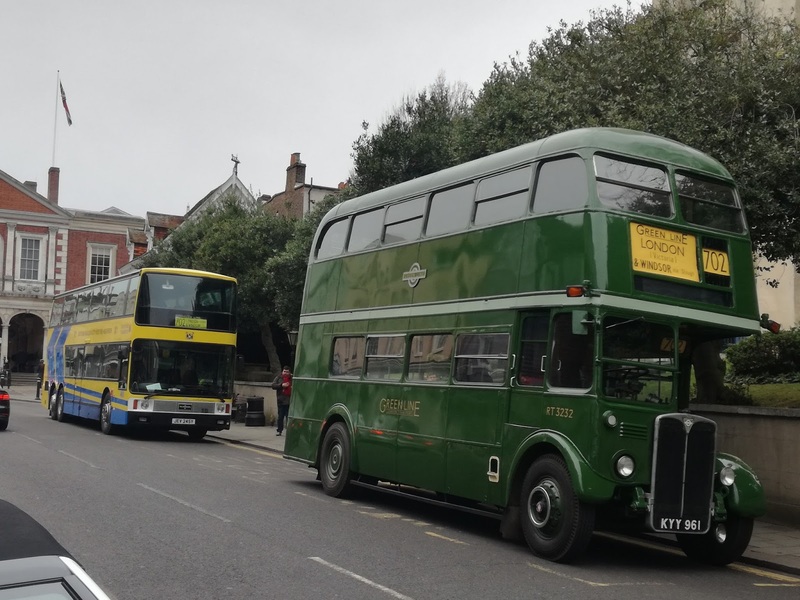 The amended plan ws to jump ship at Hammersmith, then catch a vintage Leyland National back to Victoria. 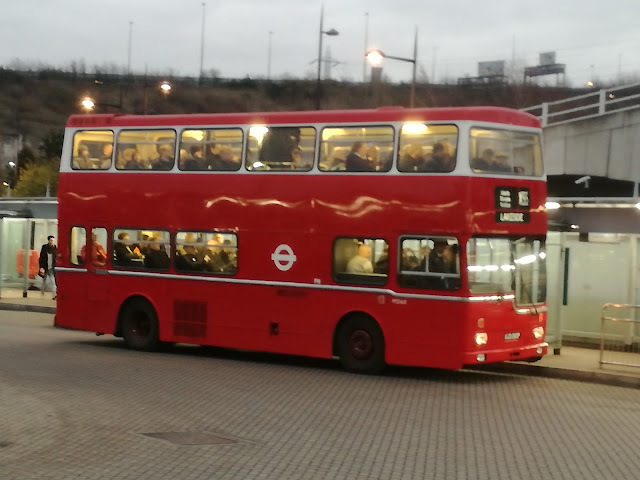 However, 500 yds from Hammersmith we passed it running seemingly empty. 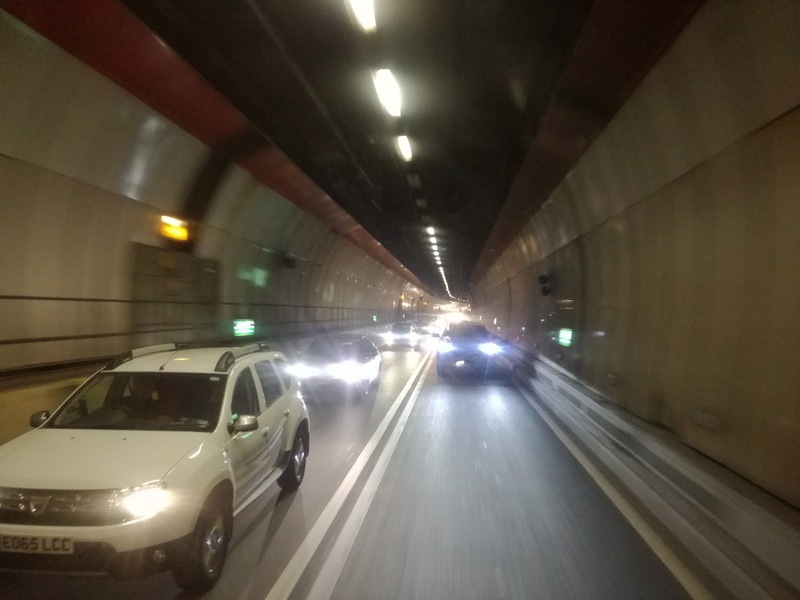 Glyn has a truly impressive turn of speed when it comes to stopping a monster bus safely, grabbing his camera and getting a perfect picture! Even better he's sent it to me to use! Glyn also managed to get a better picture of the Scania Omnilink tri-axle I had intended to catch. Ex Stagecoach Scotland, Reading Buses have acquired three of them. So onto plan C, which was to stay onto Windsor, then return to Slough for lunch and a little GWR spotting before catching Glyn on his return journey. Windsor was heaving with enthusiasts, but there was a chance to get a picture of the RT I should have started on, with the Astro behind. 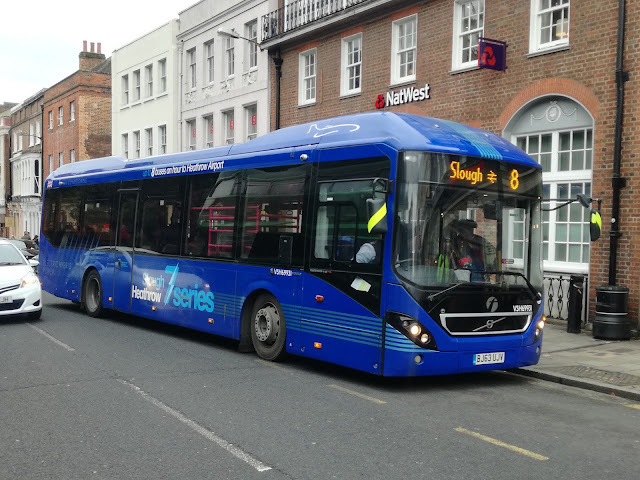 I decided to catch a local First Berkshire service bus back to Sough to give me more time, so jumped on a number 8, a rather nice 57 plate Mercedes Citaro. Quiet, few rattles and smooth. So nice, in fact, I didn't pay much attention to where we were going until it dawned on me that I recognised nothing, until I saw a signpost to Runnymeade which set off all kinds of alarm bells. A quick check of the online timetable and yes, your experienced, intrepid blogger had got on the wrong bus. I was actually heading for Heathrow. So I got off God knows where, and waited the 20 minutes for the bus back to Windsor, while phoning Glyn to ask him not to leave Windsor without me and to stop laughing! 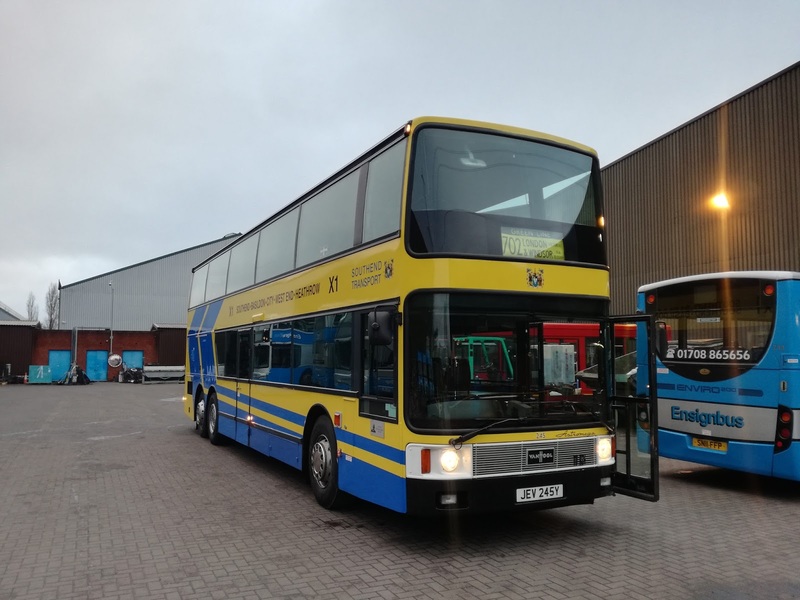 It was 15 mins late, and to punish me even further was a Volvo 7900, by far and away the worst bus ever to leave the Volvo factory. They look good but really aren't!! Sharp eyed observers will notice how clearly Slough rail station is displayed. I'm not in that club! 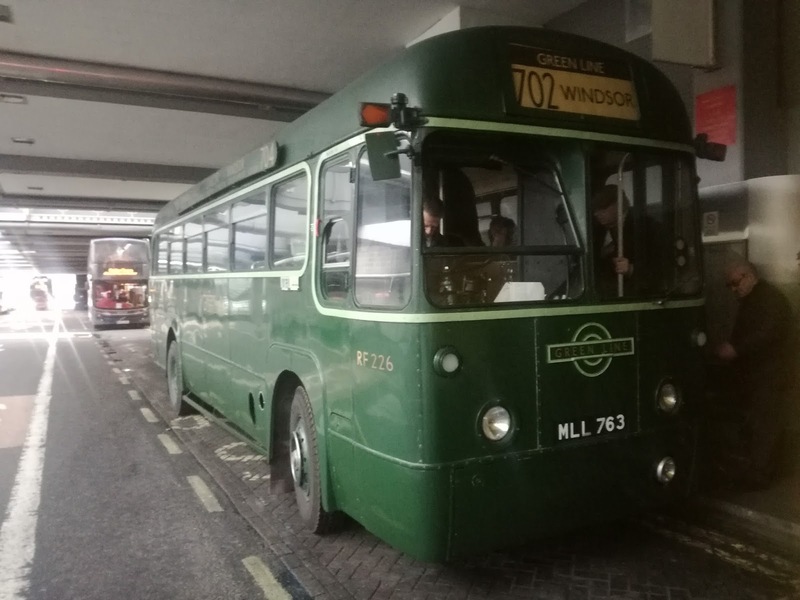 Just before we left Windsor one of the buses I wanted to see rolled in. 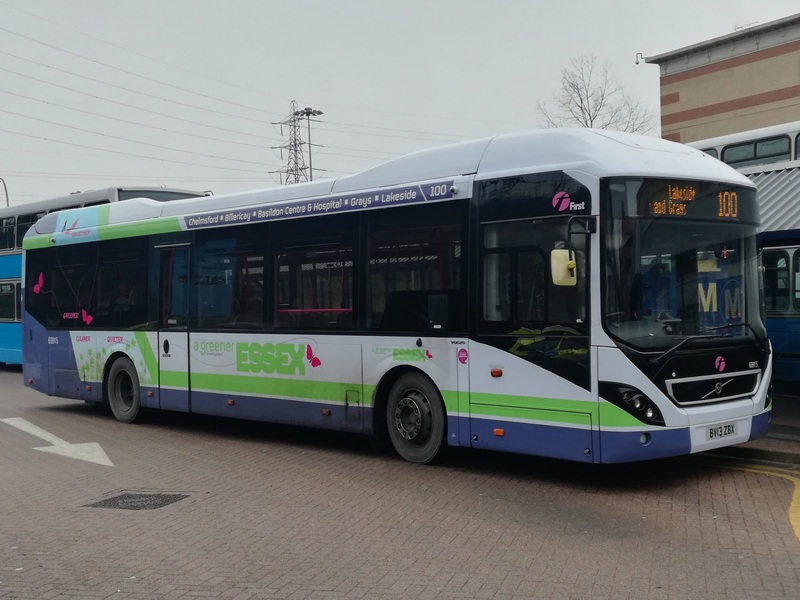 Reading Buses have utilised 2 of their own Enviro E400's for the route, and due to a mechanical problem on one of the planned buses one of them was pressed into action on the Windsor - Bracknell shuttle. Now I'm not a fan of green, and certainly not a fan of E400's, but my word this livery is dazzling. It was a very dull day so the picture does not do it justice. 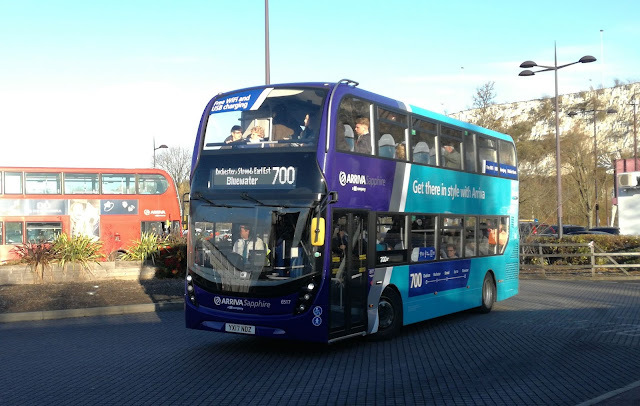 I intend to ride the 702 to try out the various vehicles in the coming weeks and I'm actually looking forward to riding this one! I've just noticed the registration. Very clever! And that was just about it. 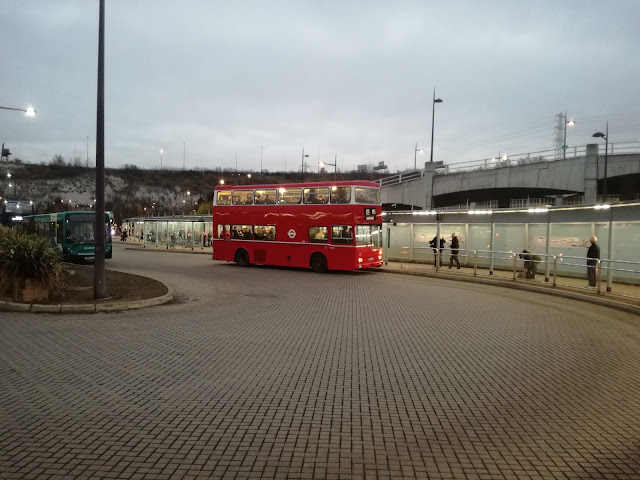 A return journey to London on the Astro, with noticeably more traffic, and a smooth journey back to Purfleet. I did very little of what I actually wanted to do, some not my fault, others definitely down to my dimness! But you know - it didn't matter. I had made two new friends, one with 8 wheels, the astonishingly good Astromega, and one with two legs, Glyn. I sincerely hope I get to ride his taxi again. Thanks, Glyn, it was a great day and I'm looking forward to the next one. 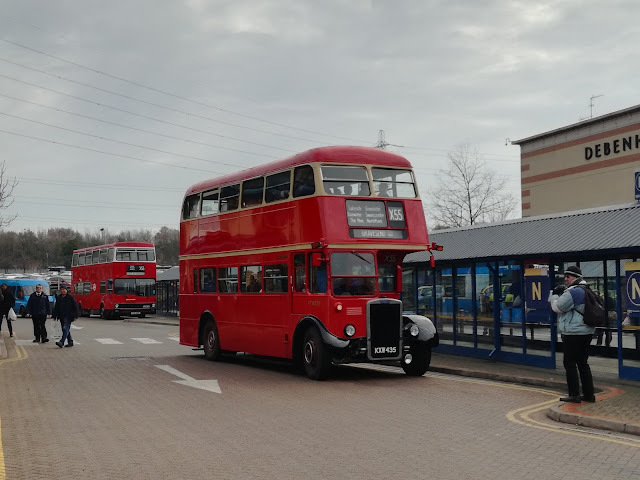 Thanks to Ross Newman for letting me travel on Ensign's buses and using the yard as a base, and well done and thanks to Martijn Gilbert for organising the day, and I wish Reading Buses all success with the 702. And thanks to those lovely people coming up to me in places I never expected complimenting the blog. Really appreciated. 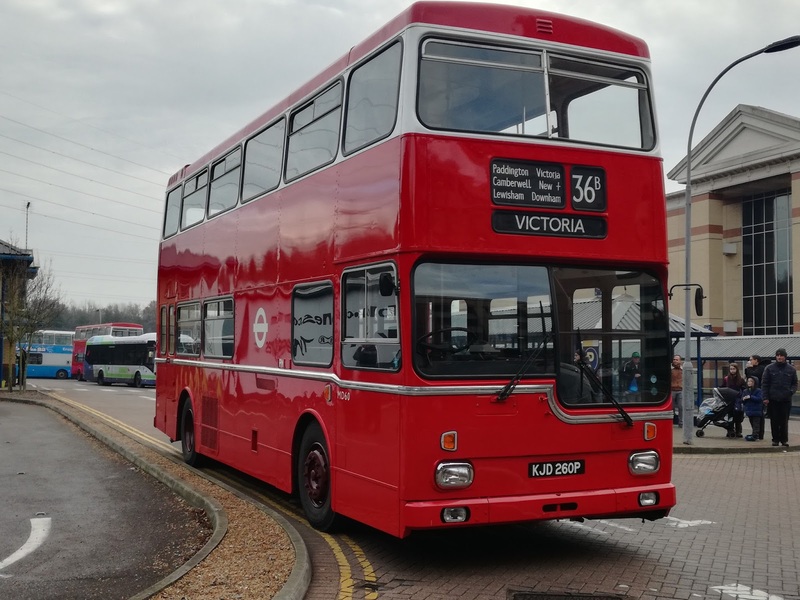 Incidentally the last bus from Victoria to Windsor and Bracknell, going onto Reading was OPEN TOP RmC 1510. I know it's been a mild Christmas in the South but that must have been a bit parky upstairs! Adam Green Tweeted this picture to the official Greenline Twitter team, who retweeted it, so I hope Adam doesn't mind me using it! One last pic of the Astro, back at base, getting a well deserved feed before being put to bed. See you for the Rochester event on 30th, and in that post I'll reveal what I got for Christmas!! 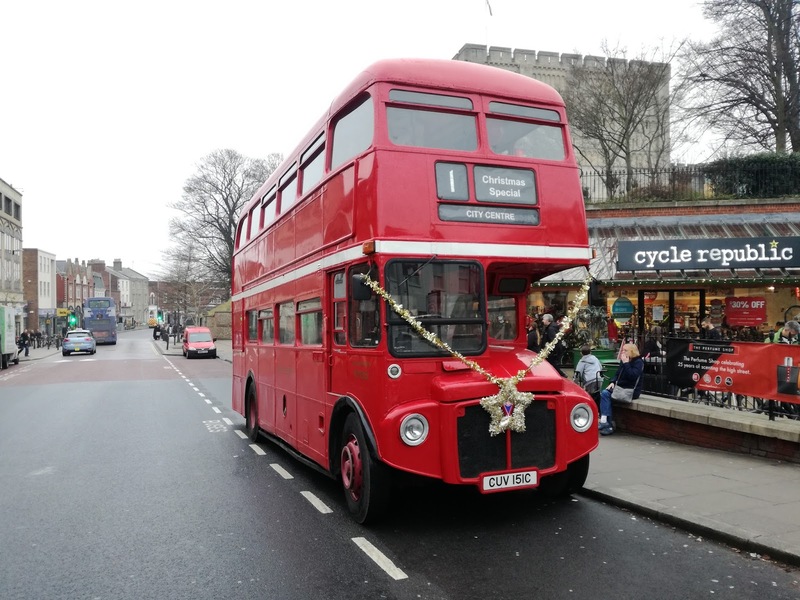 This Christmas is going to be set pretty much in the past, not a bad thing in my opinion, but those who think Summer is the best time to see and ride vintage vehicles are much mistaken. Hot on the heels of the spectacular Ensign Running Day at the beginning of the month comes two more. 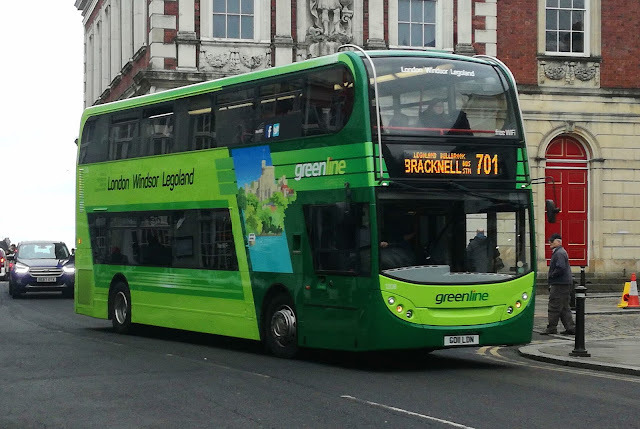 Tomorrow, Christmas Eve, is a Running Day on the Greenline 702 between London and Windsor/Bracknell/Reading. The route is changing hands from First to Reading Buses and Christmas Eve was an odd day with no official operator, so Reading decided to have a Running Day. I will be attending thanks to my friends at Ensign, who are sending 2 vehicles. 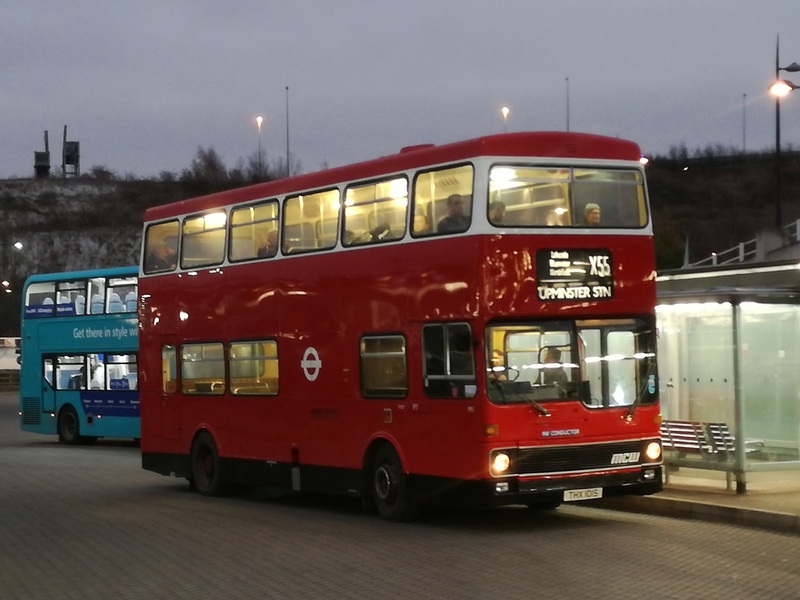 Then on 30th December there is a Running Day organised by a company who don't like me naming them, but it's in Rochester, and I will be re-acquainted with my favourite Volvo Ailsa along with other buses. However, the vintage Christmas started this week. 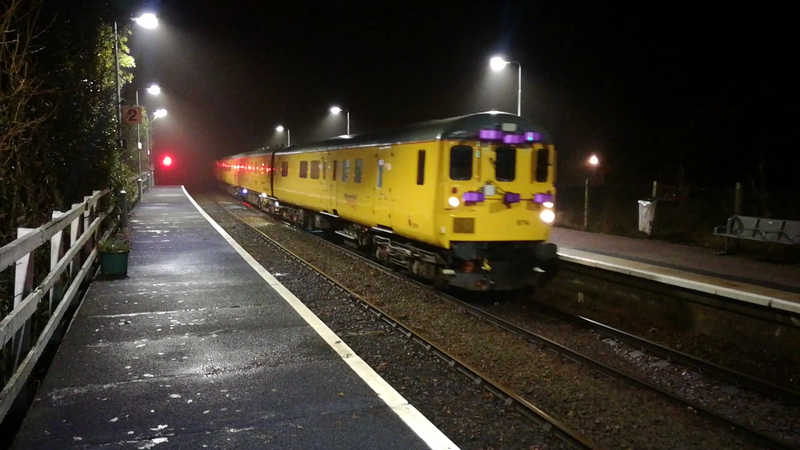 In the wee small hours of Thursday morning a test train rumbled down the East Suffolk Line. It was booked to go down the seldom used Sizewell Branch, so Tim and I were at Saxmundham at 0130 waiting for it. It was soon pretty obvious it wasn't going down the branch due to the lack of Network Rail staff but that's life. 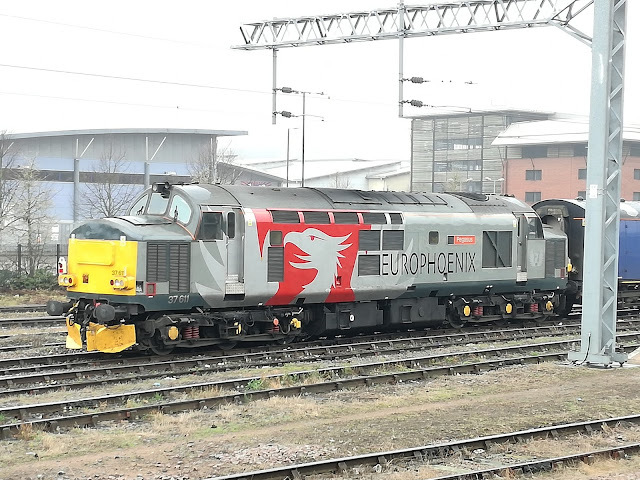 It was still worth waiting for as we knew Europhoenix liveried 37611 was providing the power. 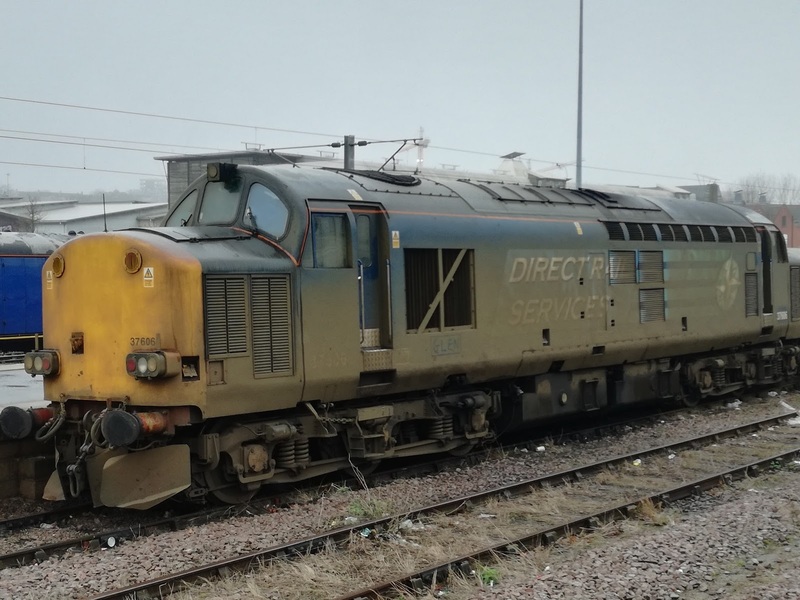 I had been to Norwich earlier in the day to see it just in case the entire service didn't run, which had been known before. Also in situ was DRS 37606, being used for stock movements currently, and in desperate need of a wash! But anyhow the test train did go through Saxmundham, with the dbso leading. 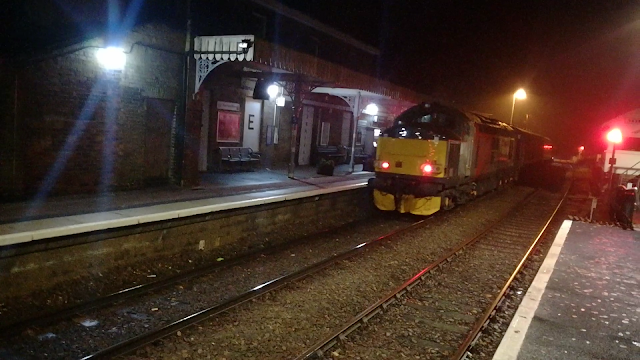 There is something magical about a rumbling Class 37 in the dead of night in the mist! We both agreed that a lot of enthusiasts really don't see things at their best. You have to be prepared to go out at all hours, in all weathers. Then you end up with sights like this. As usual those pics are stills from a video, so here it is, a lovely soundtrack breaking the still of the night. Yesterday I switched modes onto the first vintage bus of the season. City Sightseeing Norwich were running a free tour round the city using their Routemaster, which interestingly is two years YOUNGER than 37611 above. I was invited to meet up with former (?) blogger Sam Larke, who is part of the Conductor team at City Sightseeing for a ride before the heaving masses descended on the bus. 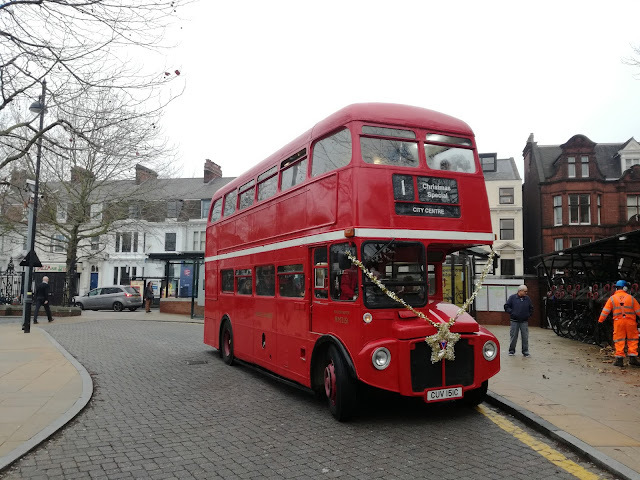 Very nice it is too, but then it's a Routemaster so that really goes without saying. That's it for this post. All that's left is to wish each and everyone who reads the blog a Happy Christmas and a healthy New Year. 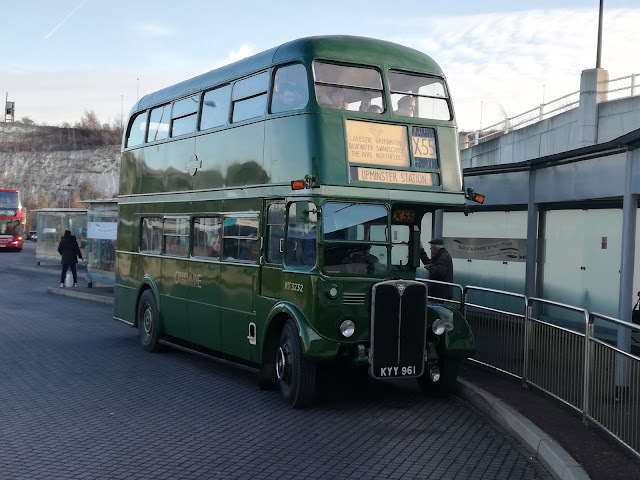 Look out for the next post around Boxing Day which will be a report of the Greenline Running Day, with hopefully a bit more depending what turns up! 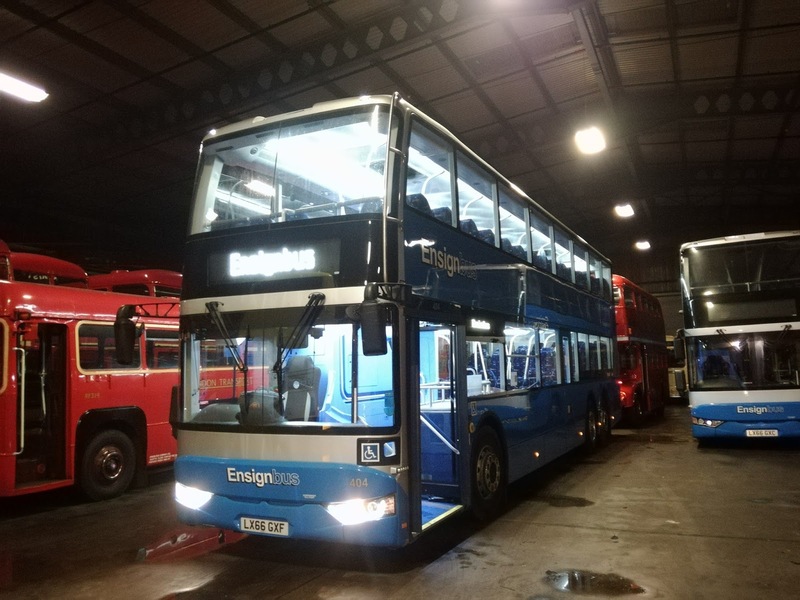 Thanks to my contacts at Borderbus I can reveal that a 4th ex Stagecoach London Scania Omni City decker has been purchased. This one is LX59 CLV and joins the 3 already there, which have been registered BB57/58 and now 59 BUS. BB59 BUS has been transferred from the E200 which held the registration, which has now been given BB03 BUS, formerly held by one of the B7tl Gemins. I understand LX59 CLV will receive the registration BB56 BUS. Pics to follow in next day or two. 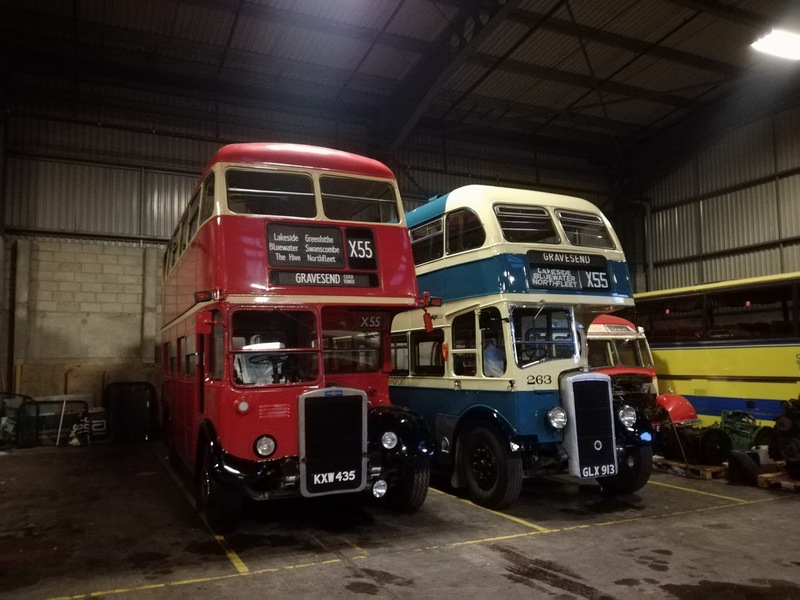 As promised here are pictures taken early this morning by Chief Engineer Dave Marshall of the two buses with their new identities. Bernice do you have a name for them? Cheers, Dave, for taking the time on a snowy morning. 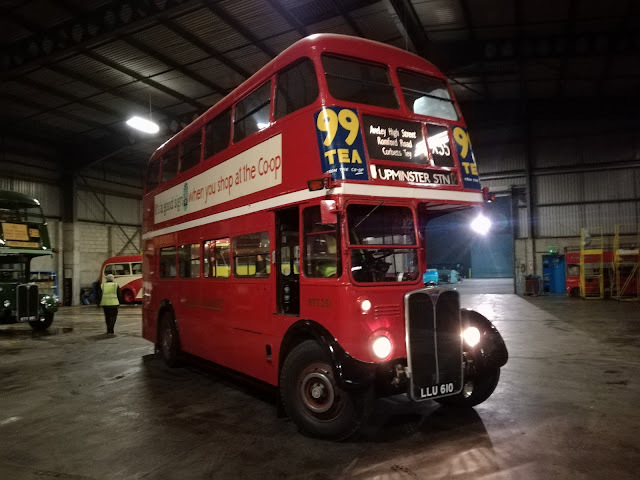 You may recognise the driver preparing BB59 - none other than Robin, who won the STEVE Award for Driver of the Year when at Anglian a few years ago! If you haven't read Part One you can read it here. At the end of Part One you left me at Bluewater having just alighted from a rather enjoyable Greenline liveried RT. I also had a phone with not much battery left, and many photos still to take so drastic action was needed. 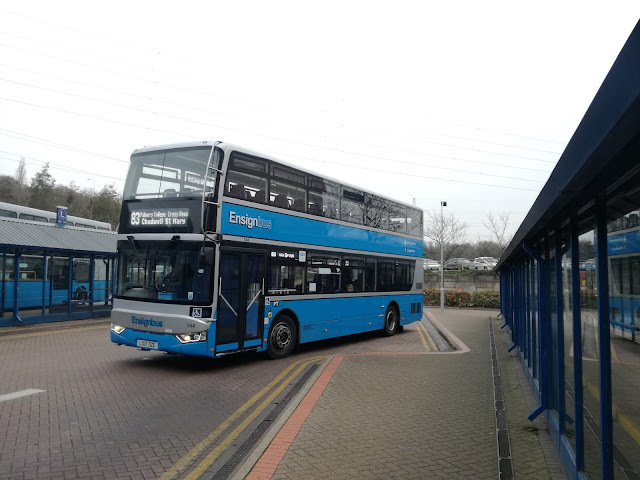 When I passed through Bluewater on MD60 I noticed Arriva Kent had got some new E400MMC's on the Medway - Bluewater 700 service advertising USB charging. Just what the doctor ordered so I decided to take a ride to Chatham and back to get the phone charged up before resuming the Running Day. There are some who really hate the new Arriva Sapphire livery, but from the front I don't think it looks that bad. I honestly don't think that's too bad. However from the rear it's a different story..
Utterly hideous, and unblock those windows too! At the start of Part One I said nothing rattled apart from one, and I would point that out when I came to it. Well look above and there it is. The newest bus was by far the worst of the day. To be fair it was great at speed on the A2 on a very smooth road. But run over a dead flea and you know all about it. Not only that but it was Dickensian Christmas in Rochester and the place was packed. 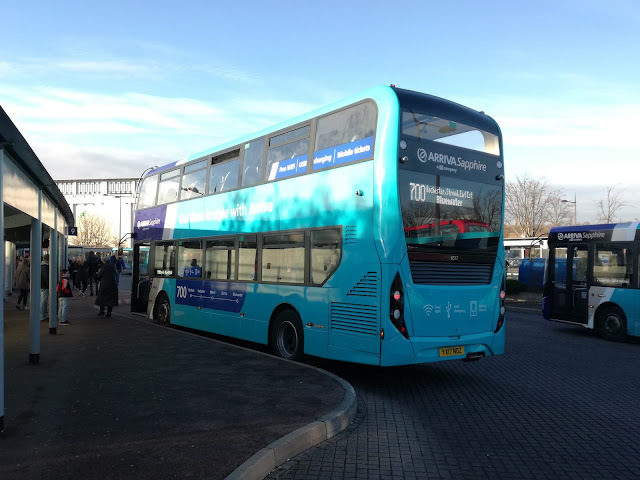 It seemed as though Arriva had made no contingency plans whatsoever as passengers were complaining about waiting for up to 90 mins on what is only a 40 minute route. Simply not good enough on one of the busiest days for the route and it's this sort of lethargy and apparent lack of care that puts people off travelling by bus. So let's leave the amateurish present in Kent, and return to the glorious past, where relief services were commonplace. I had a date with a DMS, but before that arrived I was treated to a couple of others in the fading light, allowing interior lights to take effect, and yes, MD60 by lucky chance was one of them! Then the DMS arrived. I drove open and closed top DMS in London in the late 80's and thoroughly enjoyed them. 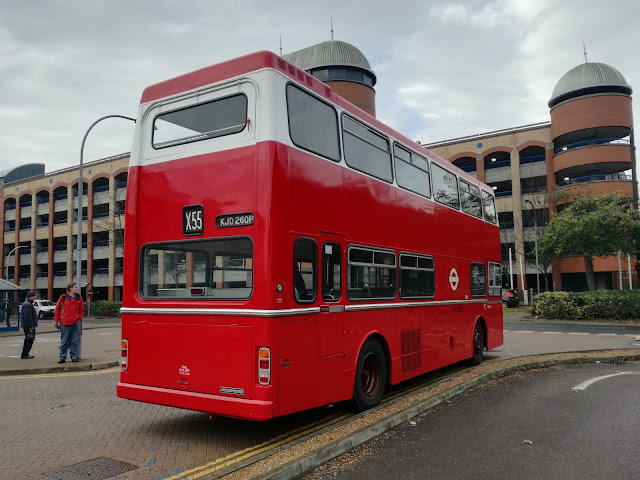 I also wanted to finally meet the driver of this one, a certain Martijn Gilbert, CEO of the highly impressive Reading Buses. We have got to know each other on Twitter but this was our first face to face meeting. I am a fan of Reading Buses - and not just because Martijn shares my hatred of rattles. 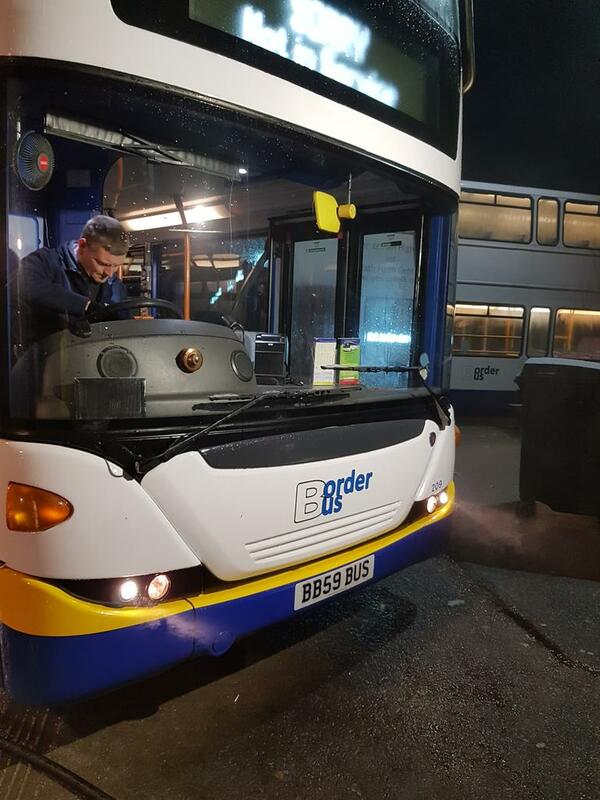 The are very forward thinking, and Martijn is the sort of boss who thinks nothing of turning up unannounced and mucking in with the night crew to clean and wash the buses. I like managers who see everyone as a crucial cog in the smooth operation of the business, regardless of their role. ...For a whole 5 minutes until Martijn broke it! We got to the top of a hill near Greenhithe, promptly lost gears and that was that. Then the fun really started. 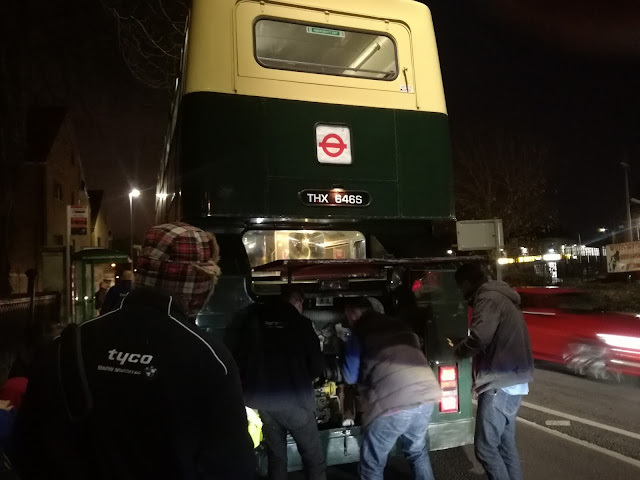 Quite a few of us on board had experience of DMS's and with things like that normal procedure is to shut the bus down via the master switch, wait a few mins then try again, just like Sky boxes these days. However none of us could locate the switch. Everything that could be opened was opened (you won't believe how many carry T keys "just in case", me included), every nook and cranny having 4 mobile phone torches shone into, but nope, couldn't find a thing. DMS stood for Denied Master Switch! Eventually after much trial and error the DMS was declared a failure. I know there's one in there somewhere!!! This meant alternative arrangements had to be made to get back to Purfleet, so I jumped on a passing RT, as you do, RT 3251 as it turns out, and got chatting to the jovial Conductor, Tony Beard, who again seemed to live just for this one day a year. This led to me joining him on the platform (very much on inside bit) and the most enjoyable bus ride I have had in decades. Going through the Dartford Tunnel on the rear platform of an RT while chatting about the history of the crossing is something I won't forget for sometime. I said about the Greenline RT in Part One that a bit more torque and a wheelchair bay and it would have serious potential. Well RT 3251 doesn't need the extra torque - it goes like a rocket! I then discovered who was driving, and the surreal aspect of the journey was complete. Driving was none other than Peter Newman, founder and Chairman of Ensign, who had flown in from CHINA the day before to be there to drive his favourite RT. I introduced myself at Lakeside, and he shook my hand like you would a friend you haven't seen for 25 years! He happily agreed to take me back to the yard so after a quick pic I jumped back on and we continued to Upminster, with Peter driving like a 10yo on a sugar rush driving a dodgem! 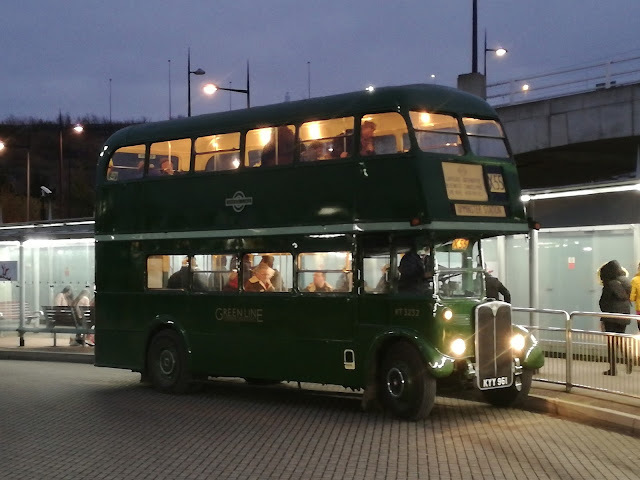 For the first time in my life I fell in love with a bus older than myself that held no personal memories. 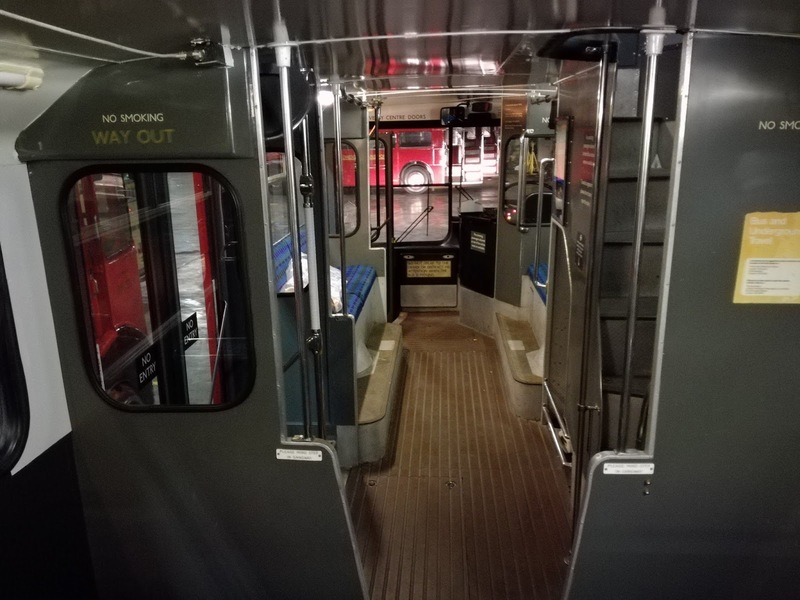 At Upminster the lights were turned off, Tony and I took a side seat each, and enjoyed a private journey on a special bus, driven by a legend of the industry. It just doesn't get any better and I only wish it had lasted a couple of hours. Back at the depot Peter continued to natter, denying any jet lag, before bidding me a friendly farewell. I decided to wander around the shed as I had unfinished business with MD60. I had been asked by a Twitter follower for some interior shots, which obviously I couldn't do with passengers on. Unfortunately when I found her she was parked up in a dark corner and interior shots were impossible. Just then, though, a chap doing the shunting, putting the buses to bed pulled up in the RT I had just got off, and I asked if there was any chance of turning the interior lights on the MD. I hadn't finished the question before he finished it for me, gave a big grin, and said of course in a way that made me feel as though he was only there to serve my needs. Over we went, lights, camera, action and interior shots gained. That, for me typified the day, and |Ensign overall. Nothing is too much trouble, enthusiasts are welcomed and embraced, and the sheer friendliness, happiness and contentment of those working at Ensign is overwhelming. It struck me today that if I have a regret in life it is that I didn't discover Ensign when I was driving. I have a feeling my life may have turned out very differently. If Santa is reading this then I could do with a book of superlatives as I have all but run out. 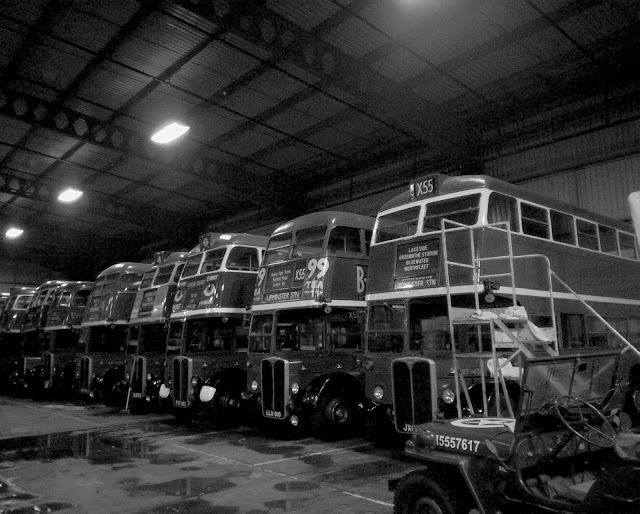 An incredible day, with incredible buses and incredible people. Even had Ross messaging me yesterday to make sure I'd enjoyed myself. 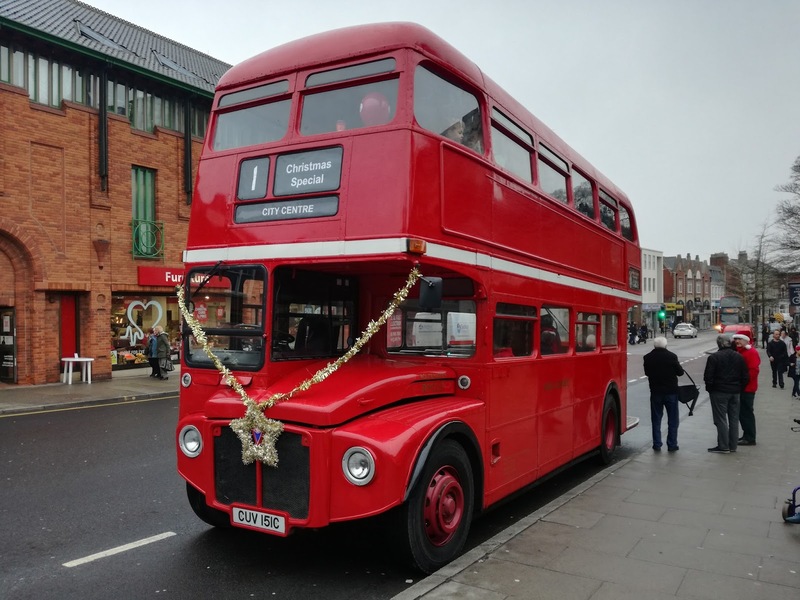 I'll tell you this - if all bus companies were run with as much dedication, enthusiasm, consideration and love, then Council bus subsidy cuts wouldn't be an issue, as they wouldn't be needed. Buses would be everyone's first choice. Thank you Peter, Steve, Ross and everyone I met and chatted to on a day I will take with me when I leave this world. I promised a compilation video of what I took at various locations and here it is. PS Just as I was about to leave the DMS arrived back on the back of the tow truck. Turned out to be a minor alternator problem, but we won't let that minor detail stop us from still blaming Martijn! 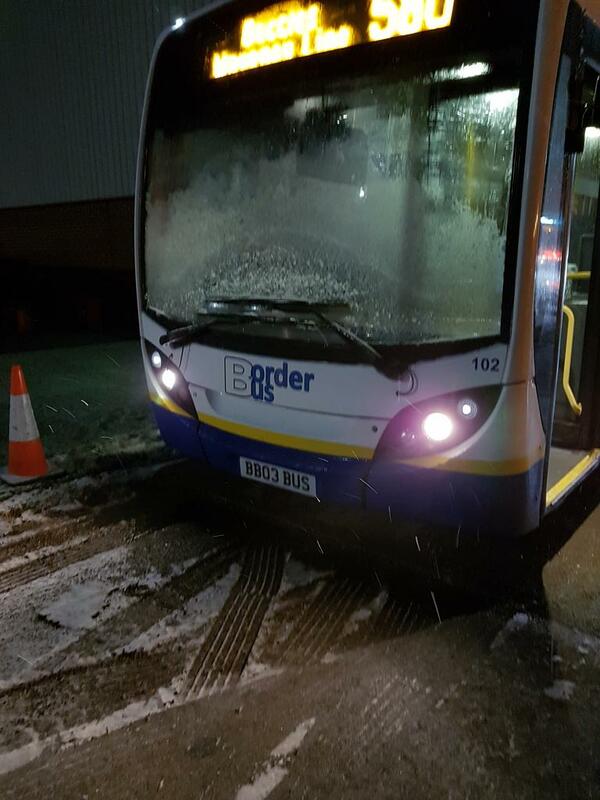 Ummmm someone broke the bus!!! A conscientious reporter should be able to report in a professional, calm, neutral manner, sticking to the facts without letting personal opinions or bias getting in the way. 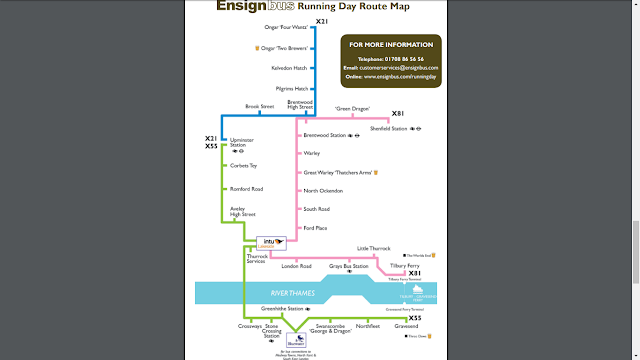 Well stuff that, the day I had at Ensign's Running Day was too spectacularly good to remain calm or neutral, and you may get the impression I rather liked it. If I can convey a fraction of my enjoyment in these posts then it will be job done. 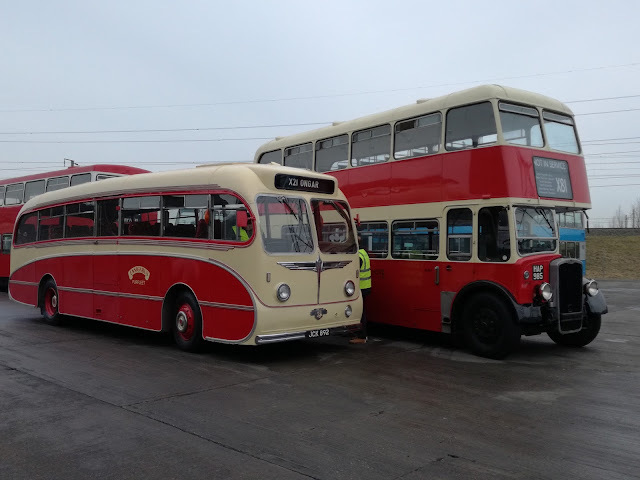 Not only had I been given a complimentary day ticket, but I had also been invited to Ensign's Purfleet base to watch the many buses being prepared. So on a grey, damp morning at 0730 I arrived and could immediately sense the anticipation and excitement. 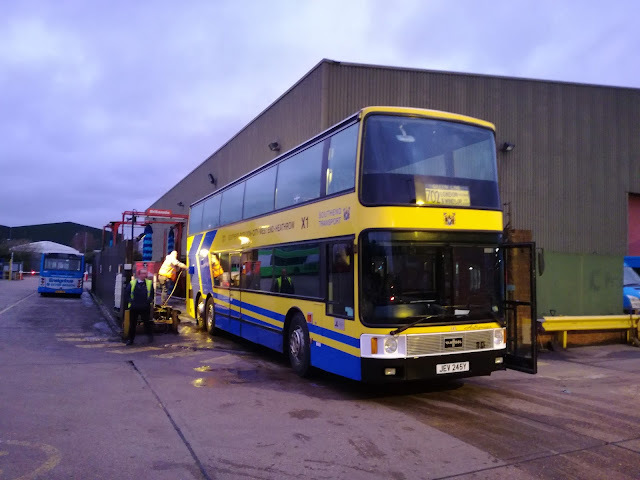 Staff still doing last minute cleaning, and buses being started up, producing fumes that would have the Green Party literally choking on their cornflakes, but that in itself evoking memories of the days when no two buses were alike, all having their own unique characters. Without exception everyone I met grinned and said hello. This included a chap in a snood and faded Ensign jacket, holding a clipboard who was here, there and everywhere. I assumed he was a depot foreman or the like, but no. This was the man behind the event, Steve Newman, Company Director! This event is Steve's baby, he has strict rules as to how young vehicles can be (not very young) what bus goes on which route and so on. Which brings us to the routes. This is not a running event where the route comprises of a trip round the block, or tour of the town's traffic lights. The buses aren't stuck in a field round the back of an attraction you've already done. The routes are long, interlinked, and accessible., from Ongar in the North to Gravesend in the South, via the Dartford Crossing, and serving both the major shopping centres of Lakeside and Bluewater. An all day ticket cost £10. This year the X81 was extended to Tilbury Ferry for the first time, allowing passengers to cross the Thames on the ferry to connect with the X55 at Gravesend. 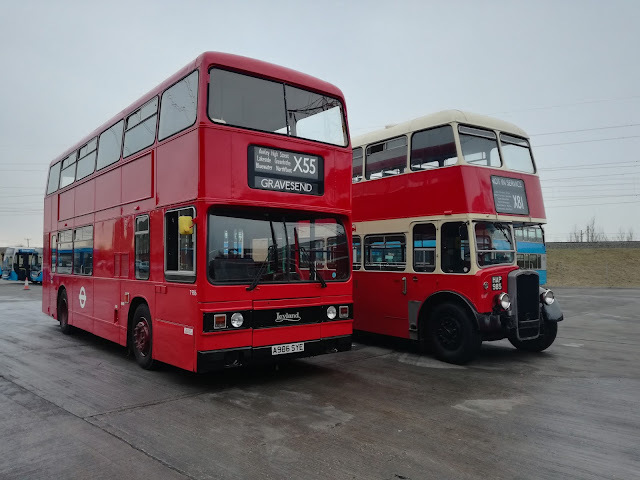 I know many took that opportunity, but I had a list of buses I wanted to travel on, and they were all on the X55. However, I did take advantage of being at the yard to take as many pictures of participating vehicles as I could, as I knew there would be many, many others taking pics at the various locations. So here is a selection. I had been told I could travel from the yard on whichever vehicle I wanted. As it was a designated spare I chose M1, the Metrobus. 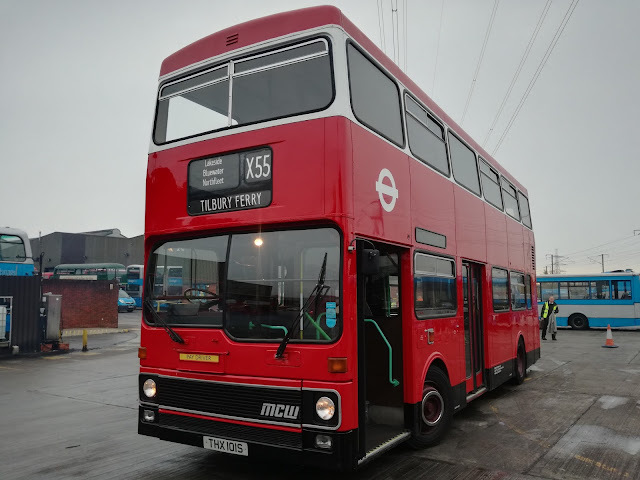 I'm pretty sure I haven't travelled on a Metrobus since I last drove one in 1994, so to not only get a ride but help carry out the checks was a rare treat. A solid vehicle but with a surging throttle and very eager brakes they do demand a certain amount of skill to drive without sending passengers everywhere! I will say at this point only one type of vehicle I travelled on rattled, and I will point that out later. So you can assume no other vehicle I travelled on rattled in any way, shape or form. 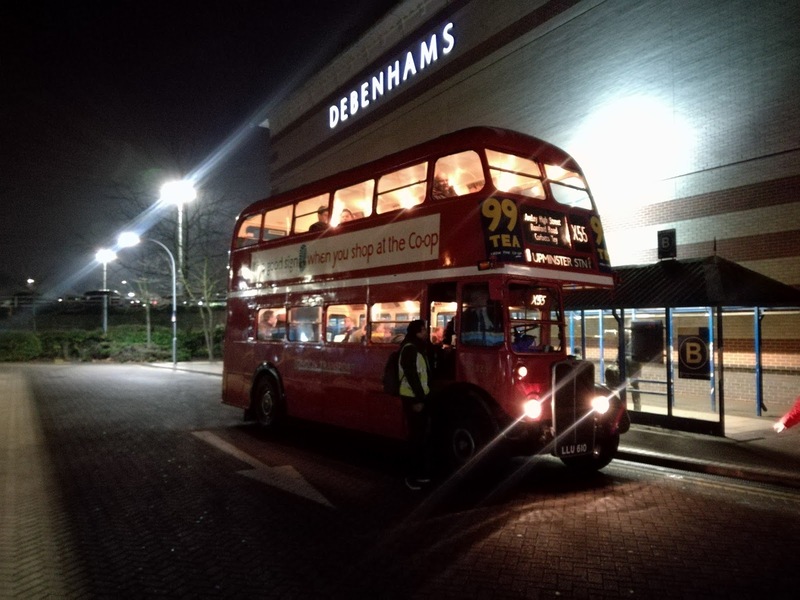 The main reason I attended was that the Metropolitan Scania was coming out to play, and I arrived at Lakeside some 2 hours early. 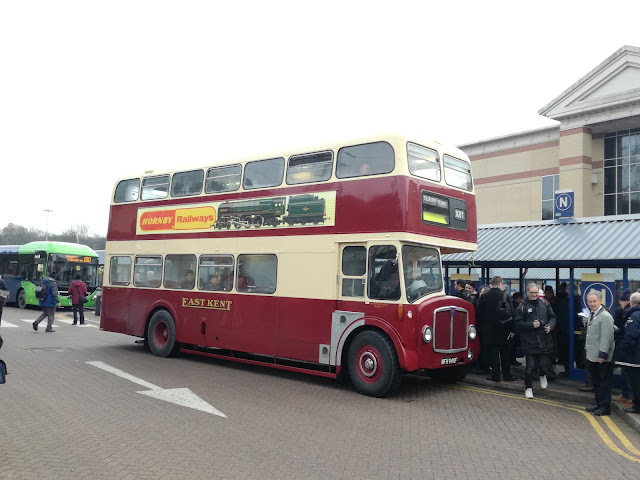 So after an unsuccessful attempt to buy a battery pack to charge my phone up in Lakeside, an issue that will be revisited later, I joined the merry throng at Lakeside bus station who were taking pics of anything that moved, and there was a lot to choose from. Here is another selection. There were also some visiting vehicles, one of which was a very smart East Kent AEC Regent. 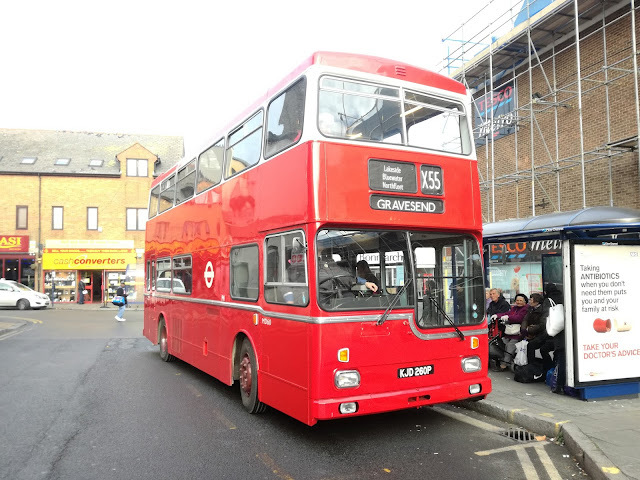 I have strong memories of the Regents in service, from watching them pass St Mary's Bay beach on a family seaside trip, to riding one along Margate seafront in their last days. I was dared to publish a pic of it so Matt, just for you! There were several more, who will appear in a video at the end of the second post. 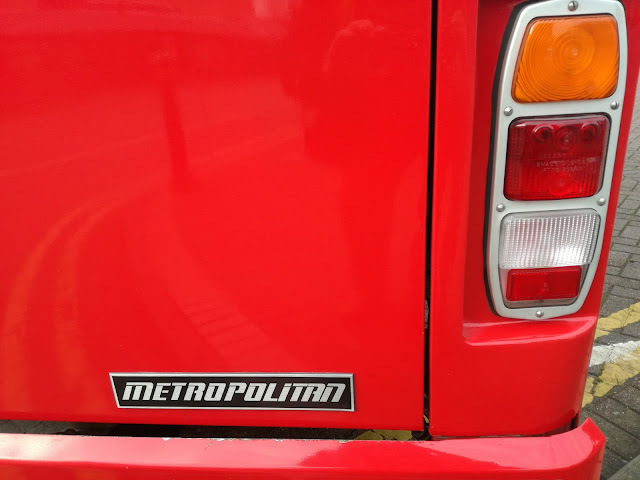 But then my whole reason for being there arrived, and for the first time in over 30 years I saw a Metropolitan Scania in motion. I overheard a chap saying there are only 3 examples left. 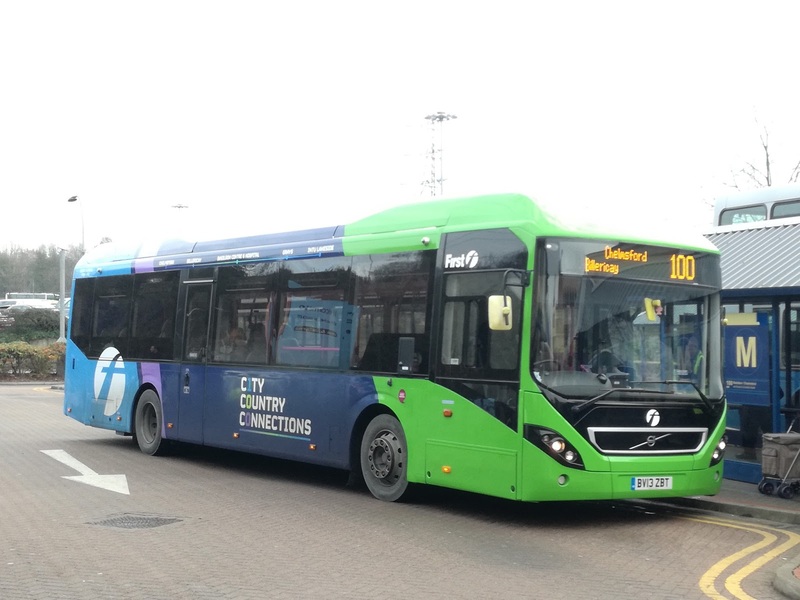 One at Scania in Stockholm, one at Leicester and this one, MD60. If anyone knows different and there are others then let me know! I don't apologise for going a bit overboard with the pics as this is such a rare sight. 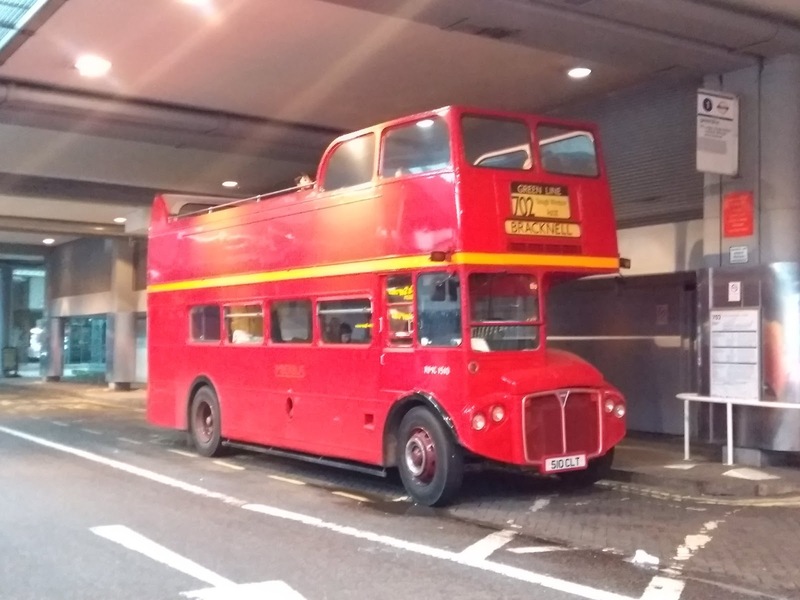 I have said before if I could ride one bus again it would be one of these, and now I was. Rather luckily another X55 left just in front and so I was able to bag one of the coveted front seats upstairs. I was slightly nervous as I have such fond memories of these futuristic buses - remember this was built in 1976. Would the ride be as smooth as I remember, would the acceleration be as good, would the engine have that Scania gurgle? Well I needn't have worried. 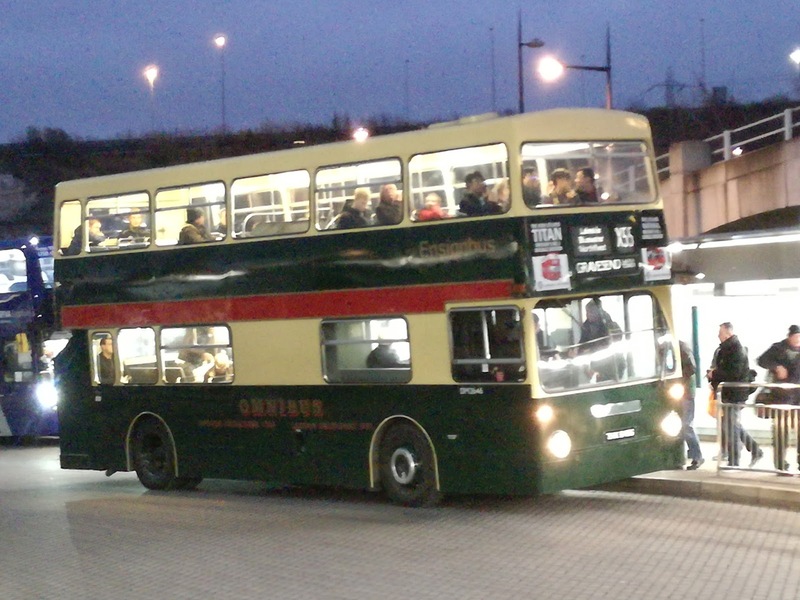 The ride was as I remembered, far, far superior to the huge majority of modern buses. The acceleration would match anything modern so you can imagine how it compared to everything else in 1976, the engine was quiet on inside but roared on outside and I fell in love with it all over again. Just a shame the bodies were awful and prone to rust - told you it was futuristic - now bodies are just awful! 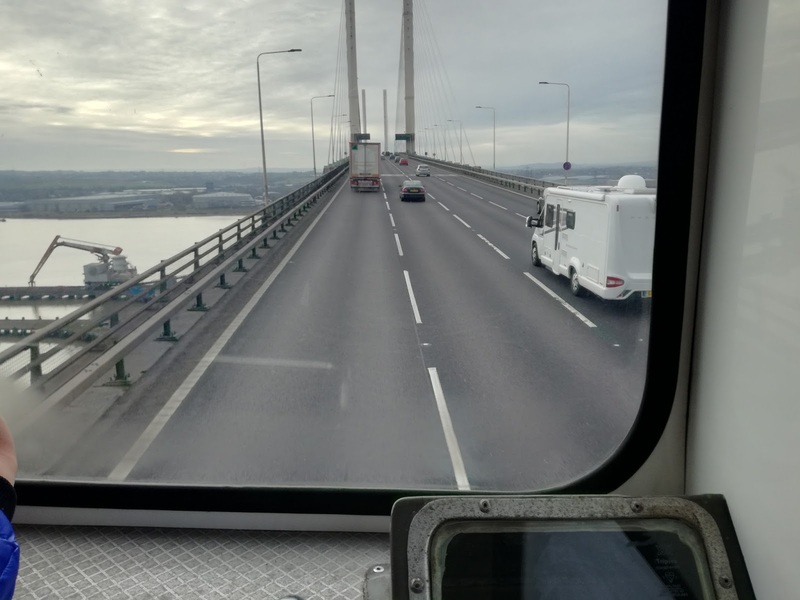 Ok, deep breath, and a sentence I never thought I'd write: I travelled over the QE2 Bridge on the top deck of a Metroplolitan Scania! What's more I have the picture to prove it! 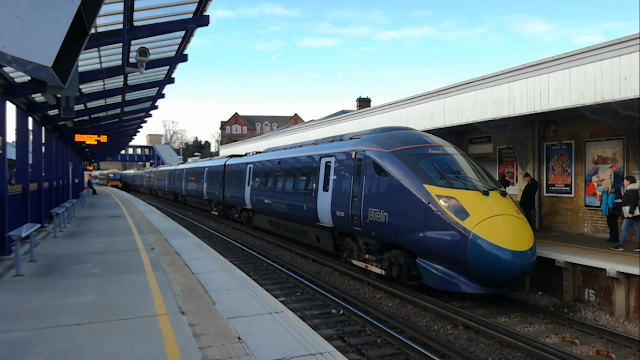 After going through Bluewater shopping centre where I spotted the seed that planned my afternoon, and a good natter to some other passengers, including a couple from Ipswich - can't get away from them - we arrived in Gravesend. I'm pretty sure none of the Maidstone & District Metropolitian Scanias ever made it to Gravesend, as Gillingham depot operated the Medway - Gravesend routes while the Scanias were based at Chatham's Luton depot, so MD60 could be the only Metropolitian to ever grace the town, not that yesterday was its first time of course..
After finding a power pack to charge my phone from only to discover it had no pre loaded charge, if I was to get any evening pics a change of plan was needed. After lunch in Gravesend (incidentally on the night of the 1987 great storm I drove the last bus from Gravesend to Chatham) I took a quick break from buses to snap a Class 395 Javelin at Gravesend Station, then hopped on a Greenline liveried RT back to Bluewater. A lovely ride, made all the better by Clippie Hannah, whose love of what she was doing was so evident. It was then I decided if RT's had a little more power and a wheelchair bay they would have extreme potential! It was now early afternoon, and I had a date with a DMS to keep, but first I simply had to get charge into my phone, which meant leaving the past and reluctantly returning to the present for a bit. In Part Two join me for the worst bus of the day, I meet a legend, a hunt for a secretive isolation switch, a ride through the Dartford Tunnel like no other, I meet an even bigger legend, and the hospitality and friendliness of Ensign is typified at the end of the day. You think I'm having fun here? ?